* Establishment is an intimate, 33 room luxury hotel located in the very heart of Sydney*s Central Business District and only minutes from major attractions such as the Opera House and Sydney Harbour. Within 6 months of its opening, Establishment was nominated *One of the 25 Hot New Places to Stay in the World* by Conde Nast Traveler magazine. * All guestrooms are designed around one of two color schemes - one bold, the other subtle ? and all are spacious with premium pure cotton linens, business desk, mini-bar, DVD and CD player, data and voice port connection, cable television, in-room safe, touch-screen room control console, and generous marble or limestone bathroom with separate bath and shower including Bvlgari amenities. In addition, the hotel has a fully-equipped fitness center and 24 hour Concierge available to all guests. 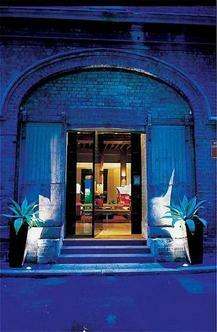 * Located in Sydney*s financial business district and a short walk to Sydney Harbour, Opera House, Botanical Gardens, and CBD shopping precinct, establishment hotel is an intimate luxury boutique hotel with 33 guest rooms, two penthouse suites, complimentary high speed internet access, private gymnasium, a host of entertainment, Food & Beverage venues at your doorstep, and world class service.